"Chasm" redirects here. For other uses, see Chasm (disambiguation). This article is about the geological concept. For other uses, see Rift (disambiguation). Not to be confused with rift zone. In geology, a rift is a linear zone where the lithosphere is being pulled apart and is an example of extensional tectonics. Typical rift features are a central linear downfaulted depression, called a graben, or more commonly a half-graben with normal faulting and rift-flank uplifts mainly on one side. Where rifts remain above sea level they form a rift valley, which may be filled by water forming a rift lake. The axis of the rift area may contain volcanic rocks, and active volcanism is a part of many, but not all active rift systems. Most rifts consist of a series of separate segments that together form the linear zone characteristic of rifts. The individual rift segments have a dominantly half-graben geometry, controlled by a single basin-bounding fault. Segment lengths vary between rifts, depending on the elastic thickness of the lithosphere. Areas of thick colder lithosphere, such as the Baikal Rift have segment lengths in excess of 80 km, while in areas of warmer thin lithosphere, segment lengths may be less than 30 km. Along the axis of the rift the position, and in some cases the polarity (the dip direction), of the main rift bounding fault changes from segment to segment. Segment boundaries often have a more complex structure and generally cross the rift axis at a high angle. These segment boundary zones accommodate the differences in fault displacement between the segments and are therefore known as accommodation zones. 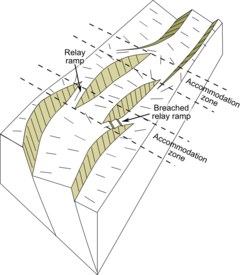 Accommodation zones take various forms, from a simple relay ramp at the overlap between two major faults of the same polarity, to zones of high structural complexity, particularly where the segments have opposite polarity. Accommodation zones may be located where older crustal structures intersect the rift axis. 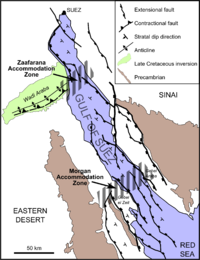 In the Gulf of Suez rift, the Zaafarana accommodation zone is located where a shear zone in the Arabian-Nubian Shield meets the rift. Rift flanks or shoulders are elevated areas around rifts. Rift shoulders are typically about 70 km wide. Contrary to what was previously thought, elevated passive continental margins (EPCM) such as the Brazilian Highlands, the Scandinavian Mountains and India's Western Ghats, are not rift shoulders. At the onset of rifting, the upper part of the lithosphere starts to extend on a series of initially unconnected normal faults, leading to the development of isolated basins. In subaerial rifts, drainage at this stage is generally internal, with no element of through drainage. As the rift evolves, some of the individual fault segments grow, eventually becoming linked together to form the larger bounding faults. Subsequent extension becomes concentrated on these faults. The longer faults and wider fault spacing leads to more continuous areas of fault-related subsidence along the rift axis. Significant uplift of the rift shoulders develops at this stage, strongly influencing drainage and sedimentation in the rift basins. During the climax of lithospheric rifting, as the crust is thinned, the Earth's surface subsides and the Moho becomes correspondingly raised. At the same time, the mantle lithosphere becomes thinned, causing a rise of the top of the asthenosphere. This brings high heat flow from the upwelling asthenosphere into the thinning lithosphere, heating the orogenic lithosphere for dehydration melting, typically causing extreme metamorphism at high thermal gradients of greater than 30 °C. The metamorphic products are high to ultrahigh temperature granulites and their associated migmatite and granites in collisional orogens, with possible emplacement of metamorphic core complexes in continental rift zones but oceanic core complexes in spreading ridges. This leads to a kind of orogeneses in extensional settings, which is referred as to rifting orogeny. Once rifting ceases, the mantle beneath the rift cools and this is accompanied by a broad area of post-rift subsidence. The amount of subsidence is directly related to the amount of thinning during the rifting phase calculated as the beta factor (initial crustal thickness divided by final crustal thickness), but is also affected by the degree to which the rift basin is filled at each stage, due to the greater density of sediments in contrast to water. The simple 'McKenzie model' of rifting, which considers the rifting stage to be instantaneous, provides a good first order estimate of the amount of crustal thinning from observations of the amount of post-rift subsidence. This has generally been replaced by the 'flexural cantilever model', which takes into account the geometry of the rift faults and the flexural isostasy of the upper part of the crust. Some rifts show a complex and prolonged history of rifting, with several distinct phases. The North Sea rift shows evidence of several separate rift phases from the Permian through to the Earliest Cretaceous, a period of over 100 million years. Many rifts are the sites of at least minor magmatic activity, particularly in the early stages of rifting. Alkali basalts and bimodal volcanism are common products of rift-related magmatism. Recent studies indicate that post-collisional granites in collisional orogens are the product of rifting magmatism at converged plate margins. The sedimentary rocks associated with continental rifts host important deposits of both minerals and hydrocarbons. SedEx mineral deposits are found mainly in continental rift settings. They form within post-rift sequences when hydrothermal fluids associated with magmatic activity are expelled at the seabed. Continental rifts are the sites of significant oil and gas accumulations, such as the Viking Graben and the Gulf of Suez Rift. Thirty percent of giant oil and gas fields are found within such a setting. In 1999 it was estimated that there were 200 billion barrels of recoverable oil reserves hosted in rifts. Source rocks are often developed within the sediments filling the active rift (syn-rift), forming either in a lacustrine environment or in a restricted marine environment, although not all rifts contain such sequences. Reservoir rocks may be developed in pre-rift, syn-rift and post-rift sequences. Effective regional seals may be present within the post-rift sequence if mudstones or evaporites are deposited. Just over half of estimated oil reserves are found associated with rifts containing marine syn-rift and post-rift sequences, just under a quarter in rifts with a non-marine syn-rift and post-rift, and an eighth in non-marine syn-rift with a marine post-rift. The Baikal Rift Zone, the bottom of Lake Baikal is the deepest continental rift on the earth. ^ Ebinger, C.J. ; Jackson J.A. ; Foster A.N. ; Hayward N.J. (1999). "Extensional basin geometry and the elastic lithosphere" (PDF). Philosophical Transactions of the Royal Society A. 357 (1753): 741–765. Bibcode:1999RSPTA.357..741E. doi:10.1098/rsta.1999.0351. Retrieved 28 October 2012. ^ Younes, A.I. ; McClay K. (2002). "Development of Accommodation Zones in the Gulf of Suez-Red Sea Rift, Egypt". AAPG Bulletin. 86 (6): 1003–1026. doi:10.1306/61EEDC10-173E-11D7-8645000102C1865D. Retrieved 29 October 2012. ^ a b Green, Paul F.; Japsen, Peter; Chalmers, James A.; Bonow, Johan M.; Duddy, Ian R. (2018). "Post-breakup burial and exhumation of passive continental margins: Seven propositions to inform geodynamic models". Gondwana Research. 53: 58–81. Bibcode:2018GondR..53...58G. doi:10.1016/j.gr.2017.03.007. ^ a b Withjack, M.O. ; Schlische R.W. ; Olsen P.E. (2002). "Rift-basin structure and its influence on sedimentary systems" (PDF). In Renaut R.W. & Ashley G.M. (ed.). Sedimentation in Continental Rifts. Special Publications. 73. Society for Sedimentary Geology. Retrieved 28 October 2012. ^ Zheng, Y.-F., Chen, R.-X., 2017. Regional metamorphism at extreme conditions: Implications for orogeny at convergent plate margins. Journal of Asian Earth Sciences 145, 46-73. ^ McKenzie, D. (1978). "Some remarks on the development of sedimentary basins" (PDF). Earth and Planetary Science Letters. 40 (1): 25–32. Bibcode:1978E&PSL..40...25M. CiteSeerX 10.1.1.459.4779. doi:10.1016/0012-821x(78)90071-7. Archived from the original (PDF) on 1 March 2014. Retrieved 25 October 2012. ^ Kusznir, N.J.; Roberts A.M.; Morley C.K. (1995). "Forward and reverse modelling of rift basin formation". In Lambiase J.J. (ed.). Hydrocarbon habitat in rift basins. Special Publications. 80. London: Geological Society. pp. 33–56. ISBN 9781897799154. Retrieved 25 October 2012. ^ Nøttvedt, A.; Gabrielsen R.H.; Steel R.J. (1995). "Tectonostratigraphy and sedimentary architecture of rift basins, with reference to the northern North Sea". Marine and Petroleum Geology. 12 (8): 881–901. doi:10.1016/0264-8172(95)98853-W. Retrieved 29 October 2012. ^ Ravnås, R.; Nøttvedt A.; Steel R.J.; Windelstad J. (2000). "Syn-rift sedimentary architectures in the Northern North Sea". Dynamics of the Norwegian Margin. Special Publications. 167. London: Geological Society. pp. 133–177. ISBN 9781862390560. Retrieved 28 October 2012. ^ White, R.S. ; McKenzie D. (1989). "Magmatism at Rift Zones: The Generation of Volcanic Margins and Flood Basalts" (PDF). Journal of Geophysical Research. 94 (B6): 7685–7729. doi:10.1029/jb094ib06p07685. Retrieved 27 October 2012. ^ Farmer, G.L. (2005). "Continental Basaltic Rocks". In Rudnick R.L. (ed.). Treatise on Geochemistry: The crust. Gulf Professional Publishing. p. 97. ISBN 9780080448473. Retrieved 28 October 2012. ^ Cas, R.A.F. (2005). "Volcanoes and the geological cycle". In Marti J. & Ernst G.G. (ed.). Volcanoes and the Environment. Cambridge University Press. p. 145. Retrieved 28 October 2012. ^ United States Geological Survey (1993). "Lake Baikal - A Touchstone for Global Change and Rift Studies". Archived from the original on 29 June 2012. Retrieved 28 October 2012. ^ Groves, D.I. ; Bierlein F.P. (2007). "Geodynamic settings of mineral deposit systems". Journal of the Geological Society. 164 (1): 19–30. Bibcode:2007JGSoc.164...19G. doi:10.1144/0016-76492006-065. Retrieved 27 October 2012. ^ Mann, P.; Gahagan L.; Gordon M.B. (2001). "Tectonic setting of the world's giant oil fields". WorldOil Magazine. Retrieved 27 October 2012. ^ Lambiase, J.J.; Morley C.K. (1999). "Hydrocarbons in rift basins: the role of stratigraphy" (PDF). Philosophical Transactions of the Royal Society A. 357 (1753): 877–900. Bibcode:1999RSPTA.357..877L. doi:10.1098/rsta.1999.0356. Wikimedia Commons has media related to Rifts. Bally, A.W., and S. Snelson. 1980. Realms of subsidence. Canadian Society for Petroleum Geology Memoir 6. 9–94. Kingston, D.R. ; C.P. Dishroon, and P.A. Williams. 1983. Global Basin Classification System. AAPG Bulletin 67. 2175–2193. Accessed 2017-06-23. Klemme, H.D. 1980. Petroleum Basins - Classifications and Characteristics. Journal of Petroleum Geology 3. 187–207. Accessed 2017-06-23. This page was last edited on 22 February 2019, at 11:57 (UTC).